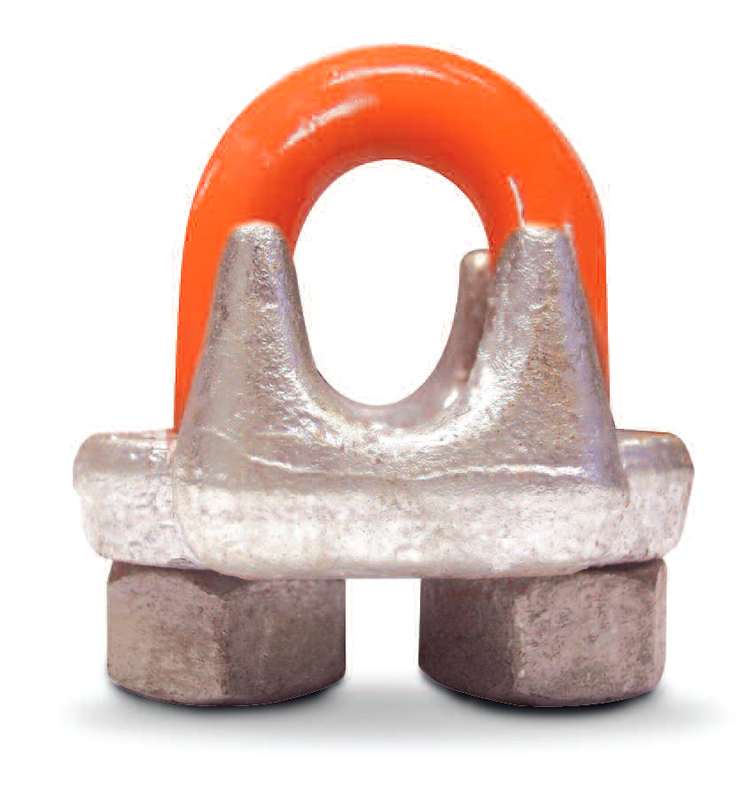 WIRE ROPE CLIPS SIZES: 1/8 TO 1-1/2 IN. Precision manufactured and galvanized to meet federal specifications (FF-C-450 Type 1 Class 1) on 1/4″ and larger. Refer to the chart above when following these instructions. Turn back specified amount of rope from thimble or loop. Apply first clip one base width from dead end of rope. 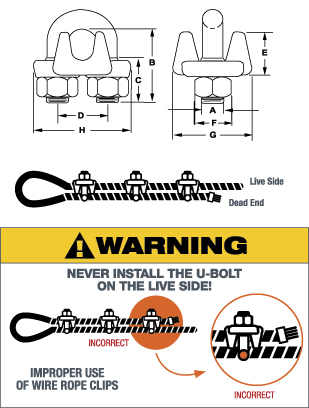 Apply Ubolt over dead end of wire rope, ensuring live end rests in saddle. Tighten nuts evenly, alternate from one nut to the other until reaching the recommended torque. When two clips are required, apply the second clip as near the thimble or loop as possible. Tighten nuts evenly, alternating until reaching the recommended torque. When more than two clips are required, apply the second clip as near the loop or thimble as possible and turn nuts on second clip firmly, but do not tighten. Proceed to Step 3. When three or more clips are required, space additional clips equally between the first two and take up rope slack. Then tighten nuts on each U-bolt evenly, alternating from one nut to the other until reaching the recommended torque. Apply an initial load equal to loads expected in use. Inspect for proper orientation and spacing of clips and retighten the nuts to recommended torque. Care should be exercised in the installation and use of wire rope clips so that the clip, wire rope, or thimble is not damaged. Do not over torque or under torque the nuts. Too much torque can result in damage to the clip and/or the wire rope. Too little torque can result in the wire rope slipping. Torque nuts to the value specified in the accompanying instructions. Clips should not be subjected to bending or come in contact with sharp object. Avoid exposure to corrosive mediums.